Mom's been sick for over 20 years. She was first diagnosed with Multiple Sclerosis in 1995, and although she's been lucky enough to experience a slow progression of this awful disease, every year sees her feeling worse and worse. 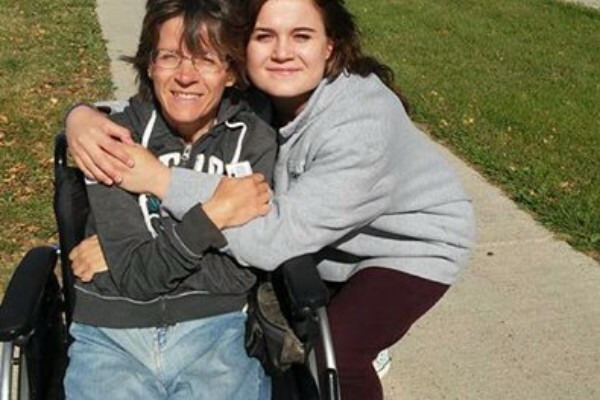 We all knew the time would eventually come that she would no longer be able to live independently and would need full-time care, and that time is now. Due to a whole bunch of different situations over the years, including a messy divorce, my sister Isabelle and I both live in Poland, where we teach English. Mom knows that with us living in Europe she'll hardly ever get to see us once she moves to a nursing home, so all she wants is to move closer to us—to Warsaw, where we'd be able to visit her pretty much anytime. We've already found the perfect place for Mom to live: a quiet place on the outskirts of Warsaw, near a park with a nice little river that will be perfect to take walks by. But moving to the other end of the world is costly and tricky, even if you are healthy. And then there's the cost of the home itself, which will come to about $19,000-$20,000 a year. You can see why it's so important for her to have money to get started. When she was still healthy, Mom worked as a nurse for years, taking care of people who needed her help. Now she needs yours. My Mom, my sister and I would be extremely grateful for any donation you can make. Please also feel free to share this fundraiser widely with others who know Trevi, know you, or would like to help her out a little. St. John's High School - class of '77 classmate.